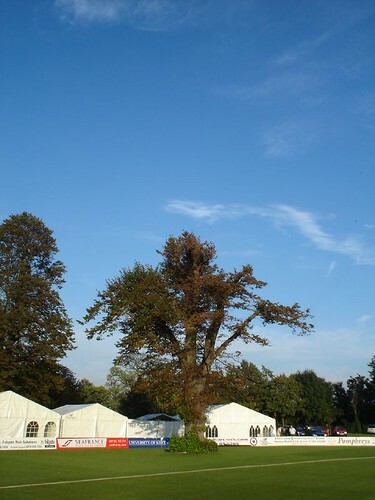 Kent CCC Tree, originally uploaded by jb83cfc. This blew down last year, but has been replaced. Now I really ought to have given my faithful readership more notice, but such is my near-total lack of organisation that I’ve utterly forgotten. Tomorrow, I reach the heady heights of 24 years. The quarter-century is rapidly approaching, and I’m distinctly concerned. To make me feel better, and to ease the monstrous hangover which will befall over the next few days, you are very welcome to buy me many gifts and presents. Amazon is a good place – if you want to know my address, let me know. England’s disasterous preparations for the first Test is rapidly turning into a farce. First it was Michael Vaughan’s knee. Then Baroda-belly hit the spinners. Then Simon Jones had a wobbly stomach. Then Marcus Trescothick flew home. Now Simon Jones has recovered from his gut-ache and has twisted his knee. No, not his dodgy right knee (which he injured/snapped in Australia a few years ago) – his left knee! It’s all going horribly wrong. According to reports, Andrew Flintoff is in line to captain England in the first Test at Nagpur on Wednesday, assuming both Michael Vaughan and Marcus Trescothick are unable to attend to their usual duties. I find this quite surprising, not to mention a great shame. Flintoff has a good cricket brain. I don’t think anyone can doubt that someone who bowls as cleverly as he does, and who bats (now) so sensibly, doesn’t understand the game very well. However, Flintoff isn’t simply another member of the team; he is the team. The addition of captaincy will, like it has affected most English captains in recent years, ruin one or both of his skills. I’m certain it’s not a long-term plan, but given his importance to the side as a bowler and batsman, why burden him now? Why not Andrew Strauss? As if England’s situation couldn’t be worse, Marcus Trescothick has flown home for family reasons and might miss the Test series.